If you've never been on a Pueblo Bicycle Party Ride, you haven't lived...or at least you haven't come close enough to dying. Bikes, beer, fun, sun, rivers, swimming, music, awesome companions and crazy good times are what to expect on the party rides. As usual, if you're the safety nazi, a bad drunk, or drama maker just stay home. Party Rides are a time to enjoy the river, the fresh air, some good exercise while letting loose of your bunched up underwear that may be riding too high and tight. Let's have some fun. BYOB. Other stop points: Angels and Demons mural, Kayak Park, City Park Frisbee Golf Course. I would like to thank you for the efforts you have put in writing this web site. I am hoping the same high-grade blog post from you in the future too. Actually your creative writing abilities has inspired me to get my own blog going now. Actually blogging is spreading its wings and growing fast. Your write up is a great example. This post is very useful for us. Because we have a lot o tips and tricks from this post. Thank you for this amazing post share. If you're the safety nazi, a bad drunk, or drama maker just stay home. Thanks for sharing party information. 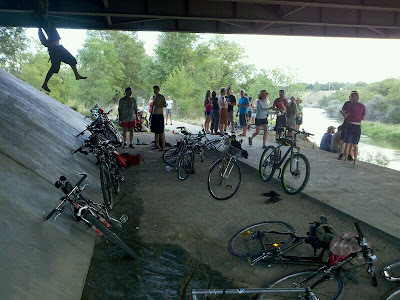 Bikes, beer, fun, sun, rivers, swimming, music, awesome companions and crazy good times are what to expect on the party rides.